Barring a change of heart, it appears Ty Jerome’s basketball career at the University of Virginia has come to an end. The 6’5” point guard announced via Instagram that he is entering the 2019 NBA Draft and signing with an agent. Click here to view Jerome’s entire post, which includes video commentary as well as the below written statement. “The last three years at Virginia have been everything I could have dreamed of in a college experience. When Coach Bennett recruited me he said he would never stop challenging me to improve, on and off the court – and he meant it. He did that every single day, and he made me a better basketball player and better man. I am eternally grateful to him and the entire coaching staff, and fans. I also want to give a special thank you to our strength coach, coach Curtis and our athletic trainer, Ethan Saliba; the best in the business! “I came to Virginia to win a national championship and to be able to do that with my brothers is a dream come true. And to the best fans in college basketball – we would not have done it without you. “Last but certainly not least, I want to thank my mom, dad, brother and entire family. The time, effort and love they have given me is truly a gift, and I would not have had this opportunity without them. Recent NBC Sports and NBADraft.net mock drafts project the Cavalier guard as a late first-round pick, while a recent Sports Illustrated mock slots him as an early selection in the second round. 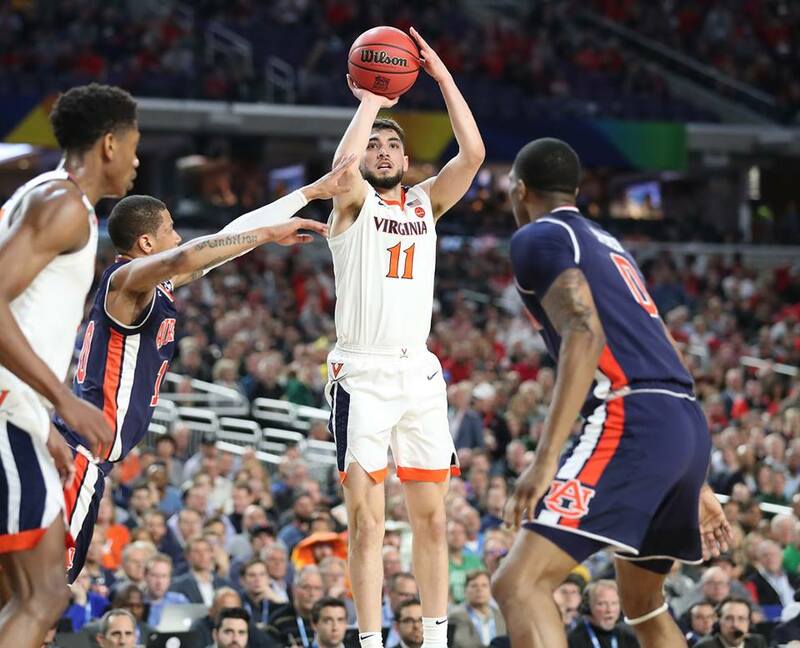 The New Rochelle, New York native is coming off a stellar Final Four performance, in which he totaled 37 points, 15 rebounds, 14 assists and three turnovers in two wins in Minneapolis, leading UVA to its first-ever men’s basketball national championship. As Kris Wright mentioned in this terrific article, Jerome is the only player with a Final Four stat-line such as that since Derrick Rose in 2008. Jerome eclipsed 1,000 career points in his Cavalier career (1,011) and moved into a tie with Sean Singletary for third on the single-season list for assists with 202. He made the all-NCAA tournament team along with Kyle Guy and De’Andre Hunter. In addition, Jerome earned honorable mention AP All-American honors as well as All-ACC second-team honors this past season. Hunter, a projected lottery pick, is expected to join Jerome by declaring for the NBA Draft and not returning to school. Guy and Mamadi Diakite are other Hoos who could test the NBA Draft waters by declaring. Update: Jerome does his first interview since declaring with Sports Illustrated. Watch it below. Yes, indeed it’s the right time, Ty. Over the next several years as you build your career in The League, I fervently hope you’ll take the time to gradually work toward completing your degree. That will pay dividends long after your playing days are over … and is a meaningful way to “pay it forward” to a program that places value on education as well as athletic excellence.